Finding amazing bourbon bars in Louisville has become a special interest hobby for many. So, get out your bourbon bucket list! You’re definitely going to want to add these best ten to it. We’re stoked to highlight these bars for you. Now our bourbon enthusiasts’ favorites can become favorites of yours, too! Maybe you’re planning an upcoming Kentucky Bourbon tour. Or maybe you’re just dreaming of the day you find yourself sipping on bourbon in the Bluegrass State. Either way, we’re thinking you’ll enjoy hearing about these particular whiskey scenes. Joining us today, we have Justin @bourbontraveler, Dirk @indianabourbon, Evan @evanhaskill, and Josh @kentuckybourbonjosh. (Give them a follow now. We promise you won’t regret it!) We raise our glasses to you four! And, thank you for sharing your knowledge and opinions with our Prestige fam. Safe to say that this crew would encourage you to settle in with a pour (in one of our whiskey glasses, of course), then read this article with a goal in mind: get to Louisville ASAP! Get ready, kids. We’re talking bourbon, food, and good vibes all around. You’ll be drooling by the end of this one. And if you’re not, just check out our line of handcrafted decanters. That’ll do the trick for sure. You need to know about these Bourbon Bars in Louisville! Okay, so our enthusiasts are playing favorites, but we’re not. Well, not today anyway. So these are listed alphabetically. Read and decide for yourself. Even better, experience and decide for yourself. After this list, be sure to leave your own suggestions in the comments or chime in on one (or more) of these fantastic places. He adds that the creative, delicious food is purposefully paired well with that liquid gold that Bourbons Bistro is known for. Put this place on your bourbon route for sure. Dirk Fentz of @indianabourbon has a lot of love for Kentucky bourbon. He also loves KY’s restaurants and bars that are always serving up some of the best, particularly in the Derby City. His top choice for best bourbon bar in Louisville is Doc Crow’s. Dirk says that the place not only boasts one of the best selections of bourbon but also makes an off-the-menu Old Fashioned called the “Bold Fashioned” that’s absolutely incredible. So, yeah. You know what to order. Dirk praises this spot as a whole: “Doc Crow’s is my favorite restaurant in Louisville. The oysters are always great, and if you like nachos and pulled pork, you have to try their Heap’n Chips.” You’ve convinced us, Dirk! We’re down, and we’re coming for ya, Doc. Feast truly sounds like the right name for this place. Justin’s Tip: If you visit in the fall, get the Apple Cider Slush. It’s insane! Justin and Dirk both highly recommend Haymarket. It was the only bourbon bar in Louisville that raked in votes from two of our enthusiasts. Justin notes that Haymarket is his answer when friends and family want to know where they can find a whiskey bar with a great selection and chill vibe. Josh Salyer (@kentuckybourbonjosh) and his wife recently took a stroll down Whiskey Row, where they visited several bourbon bars and newly-opened distilleries. Their favorite stop “without a doubt” was Merle’s. Josh said the prices and customer service were appealing, and he was pleased to find those hard-to-find bourbons on their shelf: “I hadn’t been able to get my hands on the Old Fitzgerald Bottled-In-Bond 11-Year-Old release this past spring, so I was very excited to see this one!” He noted that he also discovered King of Kentucky, BTAC, Kentucky Owl, Pappy, and more. Merle’s is a great first stop if you find yourself in Louisville, according to Josh. The bartenders are well-informed and accommodating: “We talked for a long time about recent arrivals, some of the favorites, the newly opened distilleries on Whiskey Row, and our bourbon hunting stories.” Josh tells us that the bartender that evening offered up the bottle for the Old Fitz photo below. We laughed when Josh observed, “The bottle is nicer than the bourbon. Just sayin’.” It is a nice bottle, and we definitely appreciate craftsmanship here at Prestige. 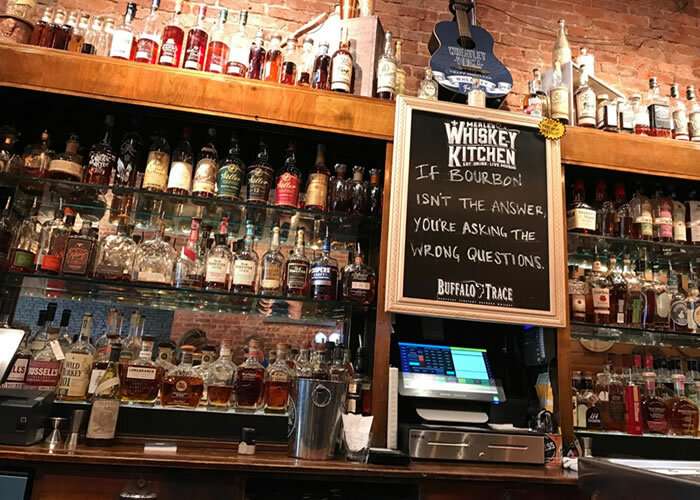 We’re a fan of Merle’s Whiskey Kitchen sign: “If bourbon isn’t the answer, you’re asking the wrong questions.” Mhmmm. Dirk rounds out his top three favorites with Old Louisville Tavern. Maybe what’s best about this place is the “local pub feel.” He highlights a very nice selection of bourbon for really great prices. Further, he raves about the combination of great bar food with affordable bargain-priced rare bourbons. That’s the kind of experience we all love, right? Head over for the awesome atmosphere, good buys, and a memorable stop for sure. Though Josh Salyer says that Merle’s is his favorite, he mentioned that The Seelbach Hilton in downtown Louisville made for an interesting stop on his recent trip. Though the selection was decent, he did note that the pour size was pretty small and pricey. But, he did enjoy getting a bourbon at this bar and exploring the historic hotel. He and his wife wandered around the Oak Room, where Al Capone was known to hang out. There were even underground escape tunnels! Justin helps us round out our ten best bourbon bars in Louisville. When visitors and locals alike ask him about planning a special occasion meal and/or about a fine dining option that offers a good selection of bourbon, his go-to is Proof on Main. Justin admits he’s hesitant to even share this particular find and a regular haunt. Indeed, he wants it all for himself. But he’s willing to let us in on the secret. We thank you, man! You’re the real MVP. Oftentimes, people want to try a lot of different bourbons, but they don’t want to break the bank. Does an experience like this even exist? According to Justin, yes. It definitely exists. Pinch yourself, guys. This isn’t a dream. Have your own favorite Bourbon Bars in Louisville? All right, crew. You’ve heard about our must-visit bourbon bars in Louisville. Are we missing any? Tell us your personal favorites and finds in the comments below. Keep (or start) planning that Louisville bourbon trip for sure. As you dream, strategize and make reservations, get in the Derby City spirit with a Mint Julep in the comforts of your own home. Check out our article – Mint Julep Recipe – Best Bourbons & Mint Julep Alternatives. Cheers, bourbon boys, and babes!